Picture Book Activities that I Recommend. When I first began to make the transition from traditional oral language therapy to text-based intervention I was confronted with a series of questions, "Which books are best to use, what grade level are they, and how best to use them?" The answers came to me slowly, through trial and error and also by consulting textbooks such as Intervention in Language Arts by Kathryn DeKemel. I can often be seen in school libraries and bookshops, leafing through the myriad texts and stories. More often, I'm seated in a crumpled huddled mass on the ground, between aisles, reading picture books. It's an endless journey of discovery for me. I have discovered that many stories have good language description, but the illustrations are a bit twee or difficult to interpret. I've also observed that some books are simply not suitable because of lack of description. Over time I have unearthed a number of picture book gems. I tend to select books from a language intervention perspective. The texts need to fulfill all the criteria I've learnt a picture book needs to be effective in a shared storybook activity. For an example of selected books please visit best picture books. A storybook's readability level is reasonably easy to calculate. There are several readability calculators available on the internet. The one I'm most familiar with is the Fry Readability Graph. Please follow the link for an explanation on how it works. 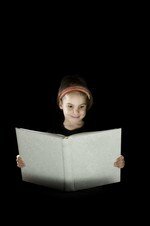 Once a text has been selected for a particular child the best indicator of its suitability is to see how well the child reads the book and whether they enjoy it or not. And by the way, I've learnt that enjoyment is a big factor in deciding whether I should continue using a text with a student. I've sometimes used picture book activities along with excellent books with attrative illustrations, richly detailed language, studded with fascinating characters, yet has completely failed to engage the child. The child's response may be, "this is so boring," or "when does this story finish?" My response is usually 'Wha...? But this story is so great. Here's why...' One of the strengths of shared book reading is that you can use your enthusiasm and knowledge of the story to engage the student, or students. But sometimes it's simply best to choose another story that will engage a particular student. Find a hobby or particular interest that the child may have (eg. motorbikes, horses, etc) and select a book that is engaging to that student, based on their particular interest.